Every year I get excited when the holidays roll around. Not for the reason that most people do – you know holiday drinks, music, or the cinnamon scented candles. No, I get excited to start planning out what my holiday tablescape will look like – nerd I know. I typically go for a timeless, sophisticated modern look full of metallic, shiny objects, and lights. This is one holiday that I don’t think you can over do the glitz and glitter! So you can only imagine the excitement when we decided to curate a Confetë Holiday Gathering Party Box. I knew immediately that we needed to put together an amazing party but more importantly a centerpiece that would be gorgeous, modern and timeless. The centerpiece features five rose gold votives, four silver dollar eucalyptus stems, and five amber scented soy candles from our friends at Steamwix. They are the perfect touch of holiday without overpowering the yummy smells coming from the kitchen. What we love about Steamwix candles is that they are 100% soy, naturally scented, and not to mention they don’t use any harsh chemicals. Which means you can soak in the amazing aromas all day long! We took the items from our Holiday Gathering Party Box and created three different looks to spice up your centerpiece game this year. The simplicity of the centerpiece is what makes this design so beautiful. Create a eucalyptus garland with the stems and staggering the rose gold votives throughout for a warm and inviting centerpiece. We bought the table runner from the new Hearth and Hand with Magnolia collection that just launched at Target. Seriously in love with that entire line. We promise you will not walk into another holiday party that will have this same centerpiece. Balloon garlands are a gorgeous statement piece and when you add in some greenery it brings it to a whole new level! This one takes a bit more time to create than the first look, but don’t let that discourage you. The balloon garland, also available in the Holiday Gathering Party Box, is easy to put together. We even posted a tutorial to show just how easy they are to make on our YouTube Channel. This last look is a classic. 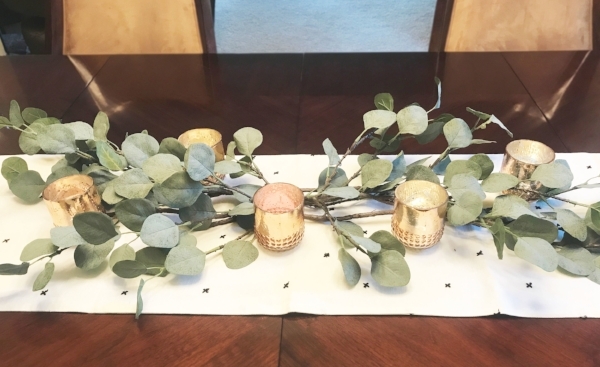 We used the same table runner from the Hearth and Hand with Magnolia collection at Target as a way to ground the vases and candles in the center of the table. Grab two vases that you have lying around the house. They don’t have match but the styles should compliment each other. We recommend white, black, or clear, however with the neutral color scheme you really can throw in just about any color. Add the eucalyptus to the vases and stagger the votives between them. Optional: If you have string lights lying around – weave it around the votives and vases to add a touch of warmth. I don’t know about you, but I find myself constantly adding things every week to my centerpieces or rearranging them. Is that normal? Good luck on crushing your centerpiece goals this year. To see our entire Holiday Gathering Party Box collection, click here.